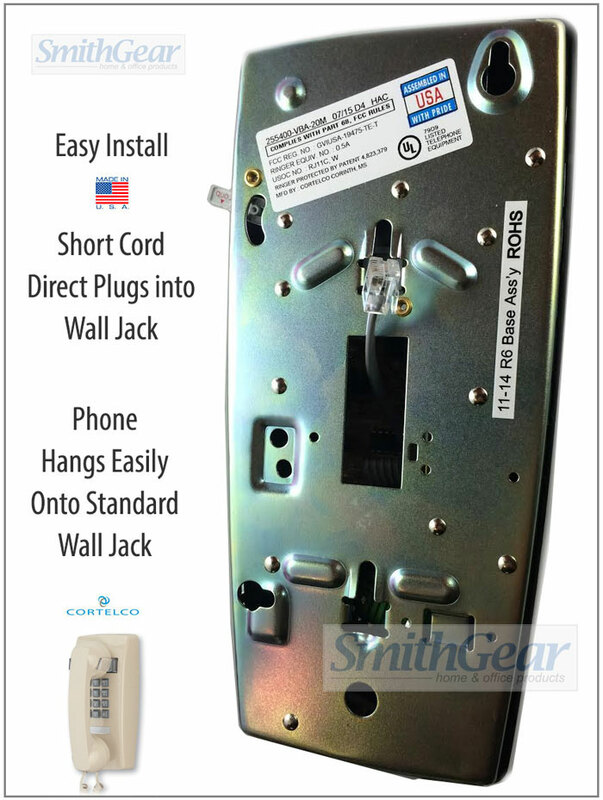 The Cortelco 2554 ASH Wall Phone from SmithGear takes you back to a simpler time -- the 1980's. It's a basic wall phone that is simple, sturdy, and built to last. This phone's true appeal is it's ease of use -- it's nearly impossible not to hang-up -- requires no batteries or AC power and comes in a variety of colors. This model offers ringer volume control and easily installs onto an existing wall plate in seconds (please watch the installation video below). Made and manufactured NEW in the USA (these phones are not refurbished --don't be fooled by imitations, this model is manufactured in Corinth, Mississippi), this phone comes with a 5 Year Limited Manufacturer's Warranty against defects in materials or craftsmanship.